How was magic practised in medieval times? How did it relate to the diverse beliefs and practices that characterised this fascinating period? 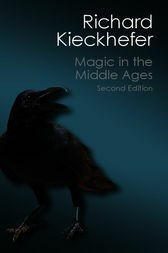 In Magic in the Middle Ages Richard Kieckhefer surveys the growth and development of magic in medieval times. He examines its relation to religion, science, philosophy, art, literature and politics before introducing us to the different types of magic that were used, the kinds of people who practised magic and the reasoning behind their beliefs. In addition, he shows how magic served as a point of contact between the popular and elite classes, how the reality of magical beliefs is reflected in the fiction of medieval literature and how the persecution of magic and witchcraft led to changes in the law. This book places magic at the crossroads of medieval culture, shedding light on many other aspects of life in the Middle Ages.